Foursquare is a venue reviews, recommendations, and lists silo based on its previous location-based checkin support, a feature that was spunout to the separate Swarm application which still shares some data back & forth with Foursquare. 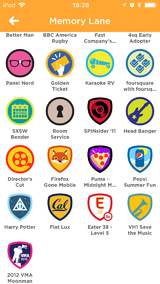 Foursquare supports creating and sharing lists of venues. By default, Foursquare starts you off with a "to-do" list. It is possible to create lists with any name, so there are many examples of lists of favorite places, collecting places to visit in another city, or lists of places that have something in common. 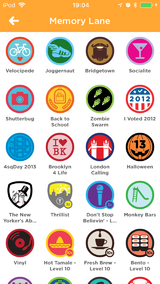 "Bars to work from in the Kerns neighborhood"
Note: most past Foursquare were included in the spin-off app Swarm. 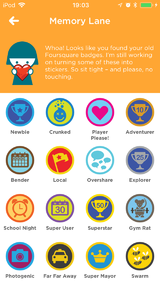 These details pertain the features available in Foursquare until they were removed. 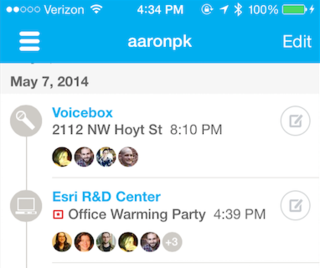 Checkins can optionally contain photos or notes. Up to four photos and notes (as comments) can also be added to existing checkins. Only the author of the checkin may add photos, but any of their friends may add comments. Checkin notes have a length limitation of 200 characters. Foursquare has feed files (e.g. .ics) and an API that can be used for export. 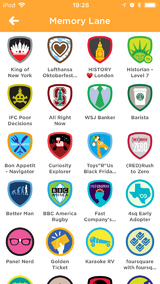 Foursquare provides feed files of all your checkins in multiple formats: RSS, KML and ICS. Either write your own script or use the one Michael Owens wrote to extract all of your Foursquare data to your local file system. The script works by connecting to Foursquare, counting how many checkins you have to determine the total number of pages of data it needs to download, and then it makes periodic calls to the Foursquare API to download the files to your local machine or server, staying within the Foursquare rate limits. Convert your Foursquare API JSON files into h-entry h-as-checkin files by writing a second script to construct meaningful HTML representations of the checkins. The script mko wrote will handle most of the conversion from a Foursquare JSON object to a h-entry JSON object. Since he uses Indie.js, the script has a decent amount of data relevant only to his purposes at this time, but it would not be difficult to convert the script into a generic converter if needed. imported all of my posted photos, likes, and comments, though the likes and comments haven't been converted into IndieWeb mentions yet. ... first check-in on werd.io that POSSEd to Foursquare? Michael Owens has been POSSEing his checkins to Foursquare since 2014-??-??. If I check in via my site, it'll check me in via Foursquare and ignore the push response for the checkin (so I don't get duplicate checkins). I've got a push endpoint on my site, so anytime I check-in on Foursquare through the app, it'll check me in via my site as well. While not as good as POSSE, those who can support micropub can use OwnYourCheckin or OwnYourSwarm to PESOS their Foursquare posts (with photos) to their website. Foursquare does some amount of tracking of what events are happening at venues in their venue database. Thus part of their UI provides the user of optionally also checking into a specific event at a venue, e.g. a particular showing of a movie at a movie theater, or a concert at a music hall. Foursquare has an API and if you use venue information from it, you must provide attribution/linking. they make you give a phone number to "receive a call to verify your claim". The call asks you to record a sentence stating your name and relationship to the venue. The call appears to not be manually screened, but presumably is archived. 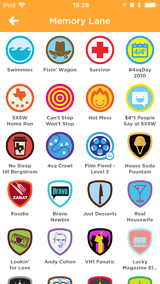 Foursquare was launched 2009-03-06 at the SXSW conference and festival where it quickly gained adoption. 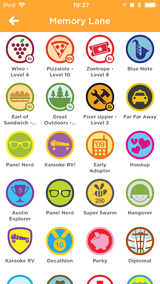 From launch until the Swarm split, Foursquare had badges you could earn all sorts of different way, some with levels of expertise (from 2x to 10x), some only available for brief periods of time (a particular day), some of which only at very specific venues. 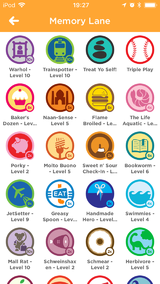 On/Around 2014-05-01 Foursquare split much of its checkin functionality off into Swarm to focus more on locations, forseeably in an effort to better compete with Yelp. 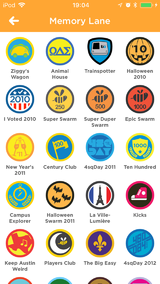 Checkins via the Swarm app created their own data, while much of it was also mirrored within the Foursquare site. Before Foursquare, there was Dodgeball, which also offered a similar check-in service, and was co-founded by one of the same people that started Foursquare. Foursquare only occasionally suffers from outages. E.g. Looks like there was an error connecting to #foursquare. Try developing an #indieweb solution instead.